The 180 utilizes Beam Forward Design coupled with high gunnels for more passenger space, under-seat storage and safety. Available Flight Series or Fishing Package can customize the 180 to suit your family's needs. Multiple outboard engine choices offer all the benefits of outboard power: trimming the engine fully out of the water, easy maintenance and extended boating sessions. Lockable port console storage compartment. Big on space. Even bigger on value. Tons of storage, a smooth ride, sporty styling and an awesome value price put the 180 in a class by itself. Its fuel-efficient standard 90 HP Mercury 4-Stroke outboard means long days on the water. 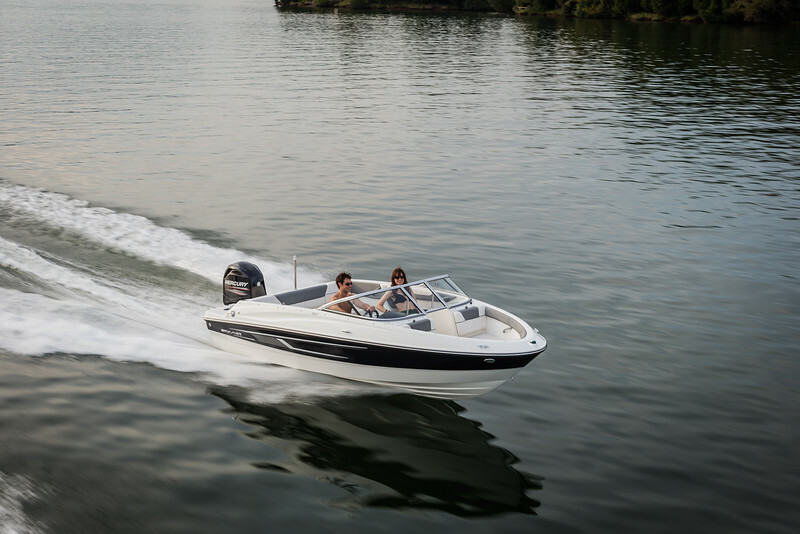 Exceptional cockpit space, a helm seat with flip-up bolster and an optional water sports tow pylon keep your crew comfortable, and active. In fact the only thing more thankful than your family, will be your wallet.